It will also function down to 2176 MHz output with reduced output power. Omission of the last multiplier enables it to function as a 23cm LO. 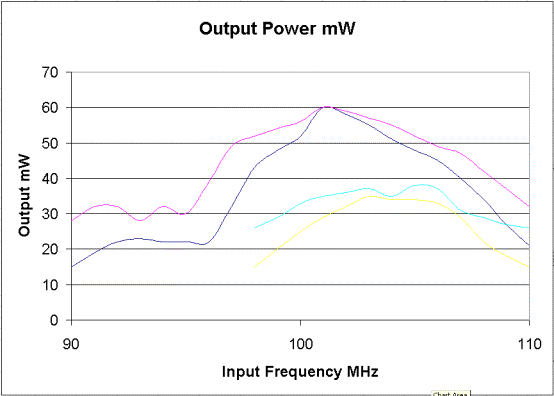 Graph plotted of measured output power taken from a prototype module. The input frequency was moved in steps and the trimmers re-aligned. 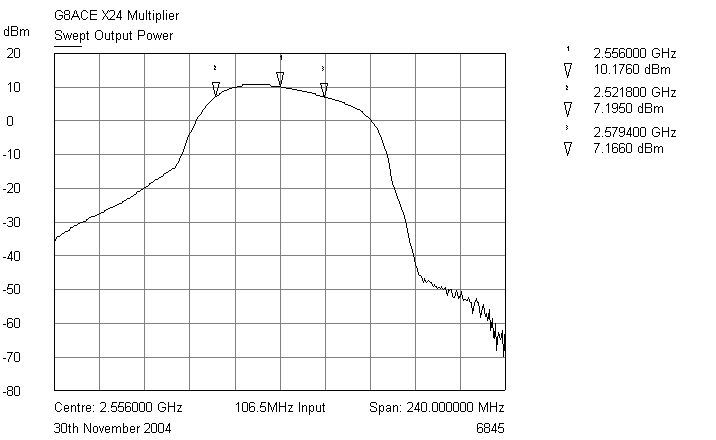 Magenta plot is optimised 2.5 GHz tuned stubs at each frequency. Dark blue plot is 2.5 GHz stubs as printed on the pcb, no optimisation. Faint Cyan and Yellow plot with an alternative BFR520 output transistor. An optional Pot RV1 allows output to be set to the desired level. and without any added tuning tabs to the striplines ¼ the LO frequency for a standard 144 MHz IF at 3cms. scale factor 24) via its tuned receiver input. on 106.5 MHz was ± 5 MHz giving the output span shown of 240 MHz at 2556 MHz. The swept plot is shown below, thanks Bryan.